Ukranian Samunnati Nataliya Lehonkova (34), a student of Sri Chinmoy, has won the women’s race of the 2017 SSE Airtricity Dublin City Marathon on Sunday, October 29, 2017. She was the first woman home, crossing the line in a time of 2.28.57 h, a new personal record. Leave the mark of your light, not a scar on the Earth. Video uploaded on YouTube by “Soul Ascension Healing Arts”. 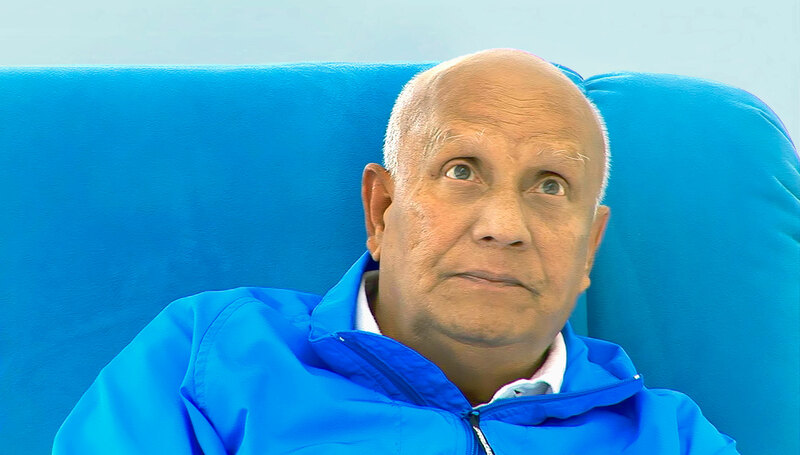 10 years ago Sri Chinmoy left his physical body and today thousands of his disciples commemorate this date with a special celebration in Queens, NY, or at their respective Meditation Centres throughout the world. 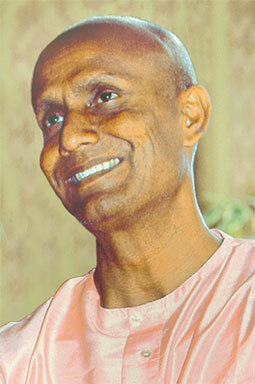 The photo shows the master during a meditation in Germany in 2005. Ashrita Furman, a 62-year-old Guinness world record champion, set a new record in Queens, New York, Aug. 27, when he created the world’s largest crayon in honor of his guru and late Indian spiritual leader Sri Chinmoy. The blue crayon, which has “Happy Birthday Sri Chinmoy” inscribed across it, is 17 feet and 5 inches long and has a diameter of 18 inches (46 cm). An international team of ten friends helped Furman in pouring the hot wax and color in a mold. The crayon weighs about 2,000 pounds (900 kg). Furman, manager of a New York-based health food store, dedicated the new Guinness World Record to his Indian-born meditation teacher, stating: “Our teacher came from India to inspire joy in other people. He created thousands of soul bird drawings with crayons in various colors to convey the joy experienced in meditation to others. With tremendous gratitude, we are honoring what would be Sri Chinmoy’s 86th birthday with the world’s largest crayon.” Furman has set more than 600 official Guinness World Records since 1979 and currently holds more than 190 standing records, including the official record for the most records held at the same time by an individual, according to a press release. As a teenager, Furman became inspired by Sri Chinmoy’s philosophy of self-transcendence. Sri Chinmoy, added the press release, also set many world records, such as composing 21,000 songs, writing 1,600 books, creating thousands of paintings during his lifetime, and writing 1,301 poems in 24 hours, among others. Furman attributed his success at breaking records to meditation, which he learnt from Sri Chinmoy and has been practicing daily for over 40 years. Meditation, he said, helps him keep his childlike spirit and the mental and physical power which is needed to continuously set new world records. Other Guinness World Records set by Furman include balancing a pool cue on finger for the longest continuous distance (7 miles 220 feet) in front of the pyramids in Egypt, racing against a Yak in Mongolia to set the one-mile sack-racing record, and underwater pogo stick jumping for 3 hours 40 minutes in the Amazon River in Peru.